Commissioned by a highly experienced blue water sailor, designed byfamous multi-hullarchitect Malcolm Tennant and built by Catman Cats, Inc.(Felix Herrin) in Urbanna, Va., this long range vessel is of superb design, high quality construction and outfitted for comfortableliving aboard and extended cruising periods.High efficiency, composite,hull forms withfour-cycle diesel propulsion provide excellent speed and economical operation in addition to the inherent stability ofthe catamaran design. The exceptionally spacious deckhouse andpilothouse along with large exterior aft decks and foredeck provide lots of room for entertaining, tender handling and storage and thecockpits allow for easy access to the water and safe boarding while dockside. This is the perfect island cruiser or luxury charter vessel. 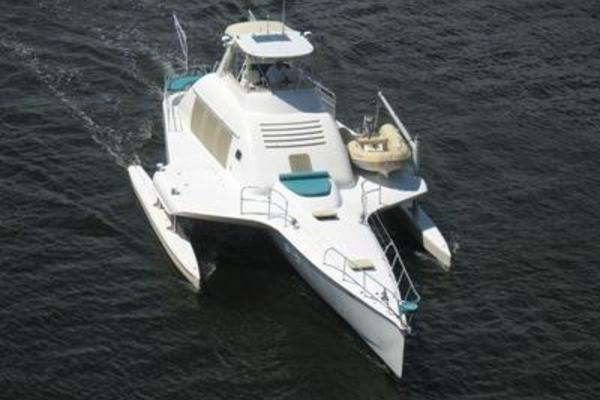 United Yacht Sales New Jersey would love to guide you through a personal showing of this 68' Catamaran Powercat 2008. This yacht for sale is located in Unknown, South Carolina and priced at $1,975,000. For a showing please contact us by filling out the form on this page and we will get back to you shortly! Dual anchoring system including two MAXWELL 3500 windlasses with chain cats, one 55kG ROCNA plow anchor and one 110kg ROCNA plow anchor. Twin Cummins QSM111M (590 horsepower each) with ZF3251V transmissions with 2.037:1 reduction driving Hale 5-blade,30x32 fixed pitch propellors through EVOLUTION DRIVES with thrust bearings.Engine hours since new are approximately 300 as of 1/24/13.